"One of my most-requested recipes! Serve over egg pastina pasta. It's the same as couscous but much less expensive! If it's too thick for you, add more water when reheating." Heat oil in a heavy pot over medium heat. Cook and stir beef in hot oil until browned completely, about 5 minutes. Pour reserved liquid from figs into a 2-cup measuring cup. Add enough water so the mixture is 2 cups total; pour into pot with the beef. Stir carrots, onion, green onions, coriander, and cinnamon into the beef mixture. Reduce heat to low and cook at a simmer for 90 minutes. Stir honey, vinegar, salt, and pepper into the beef mixture; continue cooking on low for 1 hour more. 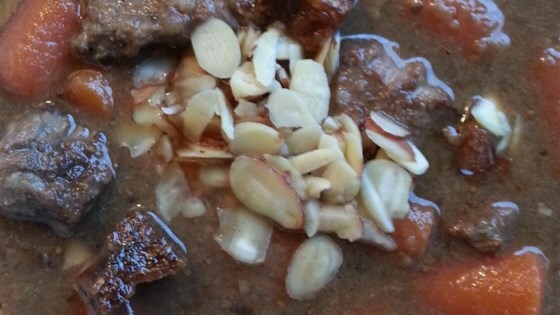 Stir figs and almonds into the beef mixture. Remove from heat. Cool for 1 hour before reheating to serve. This was different! It was coming out watery so I added beef bouillon. Not a fan of the fig in this-it became chewy and sticky. Also would have liked more veggies. Made this today and hubby loved it. I don't think I'd change a thing. Thanks for the unique recipe! I used lamb, plus rehydrated figs. It turned out delicious.